Beef in a rice wine, soy and honey sauce with vegetables and cooked noodles. 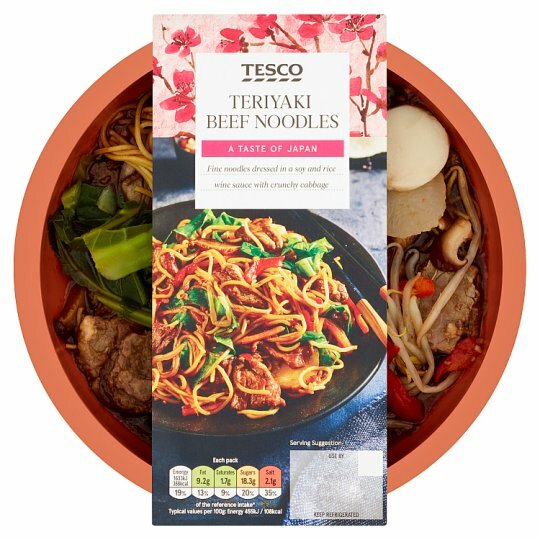 Cooked Noodles, Beef (16%), Water, Bean Sprouts, Red Pepper (6%), Water Chestnut, Shiitake Mushroom, Cabbage (5%), Demerara Sugar, Rice Wine, Rapeseed Oil, Cornflour, Ginger, Garlic, Sugar, Honey, Sesame Oil, Caramelised Sugar Syrup, Red Chilli, Soya Bean, Salt, Molasses, Wheat, Chilli Purée, Tomato Purée, Fermented Black Soya Beans, Yeast Extract, Rice Vinegar, Sunflower Oil, Star Anise Powder, Rice Flour, Spirit Vinegar, Malted Barley, Garlic Powder, Cinnamon Powder, Fennel Powder, Clove Powder, Lemon Peel Powder, Black Pepper, Garlic Oil. Instructions: Remove film lid. Heat a lightly oiled heavy based frying pan or wok. Stir fry for 4 minutes, stirring occasionally. Serve immediately.